You've found the website of Cub Scout Pack 89! Pack 89 is a very exciting Cub Scout pack that meets at Village Tech Schools now located in Duncanville, Texas! We were previously located in Cedar Hill and have now moved locations and are slowly transferring all our information over. Meeting Times are every Monday at 7pm, and closes at 8pm. Please view our calendar page for confirmed meeting dates. For more information please contact our Pack Committee Chair or the Pack Cubmaster for more information. Contacts are below. Thank you for visiting and we wish you happy Scouting!! If you would like to come visit one of our meeting or for membership please contact us! The PACK IS BACK!!!! We hope all our scouts had a great summer and now its time to go full steam ahead!!!! We have a new monthly Pack 89 Newsletter that we will pass out at every Pack Meeting so make sure you attend and get all the information for upcoming meetings and events! You may download the months newsletter link below for more details if you were unable to attend the meeting. DATES TO REMEMBER FOR 2018-2019 SCOUTING SEASON! so please stay tuned for emailed updates!!!! Make sure to check the Calendar for additional dates and details!! 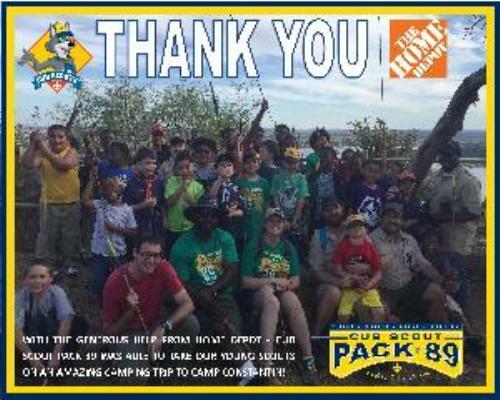 Pack 89 will be fundraising thru out the scouting season to help offset the cost of dues, events activities and camping trips. More info on these fundraisers will be discussed at our Pack Meeting so please make sure you attend! US TO HAVE AN AMAZING FALL CAMP OUT!!! PROVIDED THE PACK WITH DISCOUNT COUPONS! SMALL CAMP STOVE TOWARDS OUR PACK CAMPING GEAR! Profits from this sale will go towards your scout!!!! Monday, November 6, 2017 - All orders & money must be turned in. Monday, December 4, 2017 - Popcorn pickup at meeting. Camps at least once every season. Fall, Winter, Spring, and Summer. Click the links below for a video of our past scouting seasons!!!! Future Scouts: Seize the opportunity to learn cool new things, experience things you've only imagined (or seen on TV), have a blast with your family and friends, and earn awards. Future Scouting Parents: This is your chance (”blue and golden opportunity”) to teach your son invaluable lessons, instill values that you think are really important, and most importantly, prove to your whole family that you know how to have FUN! Research has shown that early involvement in values-based programs is vital to strong character development. The longer a boy stays in Scouting, the more likely he is to develop the values and skills needed to become an ethical and productive citizen. Register Anytime: Even though our Cub Scout programs kick into high gear in September, you can join at any time of the year! We welcome new members year-round, and if you just want to check out what Scouting (and what Pack 89) is all about, you can always come to one of our pack meetings or events. 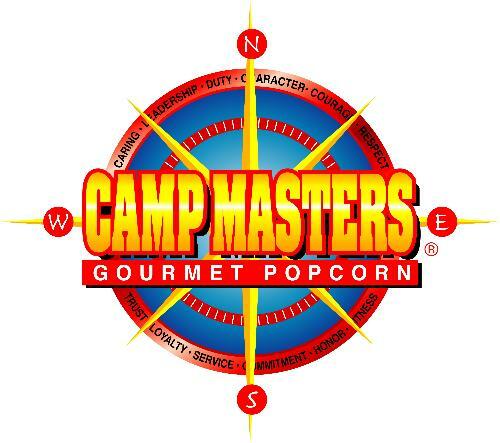 Just contact our Cubmaster via email and see when we’re having the next meeting or event. Parent Handbook: Pack 89’s Committee has created a parent handbook which will hopefully answer some of the many questions families new to scouting may have. If you don’t find answers to your questions, feel free to e-mail the Committee Chairman, Gerald Watson or the Cubmaster, Jesus Quintero. Both will do their very best to answer whatever questions you may have. Or, if you want to try to find your answer, please check out the Parent Handbook. If you’re ready to join the fun, please e-mail the Cubmaster and we’ll get you on your way! What in the World Do My Scouts Wear? The Boy Scouts Of America have answered your call for assistance! Check out this awesome website to help those new to the world of scouting navigate the uniform requirements and optional components available to you. Please note, however, that Pack 89 is a "waist up" unit meaning that we do not require the official socks, shorts or pants. We do prefer, however, if boys could wear shorts or pants with loops so that they can wear their adventure loops as part of their full Field Uniform. Hats are also optional but when your scout is at an outdoor event, it's always nice to have an additional uniform component that not only fits in nicely with their Field Uniform (pictured here), but that which can also be worn with their Activity Uniform (Pack t-shirt) to help signify which den level they are affiliated with. The uniform link is HERE. However, we also have these rank specific .pdf file below for you to have a visual aid for those components you need to buy from our local Scout Shop. The Boy Scouts of America Scout Shop is a separate store located at 8605 Harry Hines Blvd, Dallas, TX 75235. Their hours are 9:00 am - 6:00 pm Monday - Friday and 10:00 am - 4:00 pm on Saturdays, closed on Sundays. You can also shop online at scoutstuff.org and have it shipped to your front door!